This week in Orange County, a coalition of lesbian and gay Vietnamese groups staged a protest after being excluded from Westminster's annual Lunar New Year Tet parade. They were specifically asked by organizers not to participate: LGBT group says it's been ousted from Tet parade. The LGBT coalition has marched in the parade for the last three years as part of the overall Vietnamese American community. This year, they tried to submit their application to join this weekend's festivities, but were denied by parade organizers. They were instead encouraged to organize their own parade. Right. And basically defeat the entire purpose of marching in the Tet parade in the first place. On Monday, the Partnership of Viet Lesbian, Gay, Bisexual and Transgender Organizations and their supporters demonstrated in front of the offices of the parade organizers in Little Saigon. "They deny our human rights, which they've been fighting for all these years. What about us? We're not humans?" 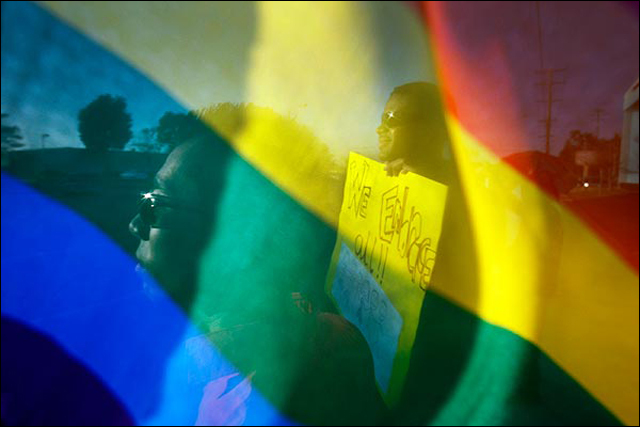 Le said, as supporters held a giant rainbow banner. The parade traditionally has been put on by the city. But this year, facing financial difficulties, Westminster turned over the reins of the parade to a community coalition. That coalition includes the Vietnamese Interfaith Council in America, which called for a boycott of the parade the past three years because of gay groups' participation. Assistant City Attorney Christian Bettenhausen said Monday evening that he was working on a letter that would encourage parade organizers to include the LGBT group. But the city cannot force the organizers, he said, because it is not running the event. Steven Gonzalez and Luan Tran, attorneys for the LGBT group, said they hope to resolve the issue without going to court. But if necessary, they will file suit, they said. More here: Gays protest for inclusion in Tet parade. Here's an online petition calling on community support to stop this discrimination: Little Saigon Tet Parade Board of Organizers: Stop discriminating against VA LGBTs from participating in the Tet parade.